2015 Jeep Wrangler Sport 1-Owner Hard Top and Automatic transmission and brand new upgraded wheels and tire package. Jeep has been well maintained and well taken care of. Don't let miles fool you Jeep is much nicer then many out there with less miles. Please look at all the pictures to see how nice this Jeep is. This Jeep includes: QUICK ORDER PACKAGE 23S Aluminum Wheels A/C Leather Steering Wheel Tires - Rear All-Terrain Tires - Front All-Terrain BILLET SILVER METALLIC CLEARCOAT POWER CONVENIENCE GROUP Power Mirror(s) Power Windows Heated Mirrors Security System Power Door Locks Keyless Entry TRANSMISSION: 5-SPEED AUTOMATIC (W5A580) 5-Speed A/T A/T ENGINE: 3.6L V6 24V VVT (STD) V6 Cylinder Engine Gasoline Fuel BLACK 3-PIECE HARD TOP Targa Roof Rear Defrost Convertible Hardtop *Note - For third party subscriptions or services, please contact the dealer for more information. * This vehicle is loaded with great features, plus it comes with the CARFAX BuyBack Guarantee. 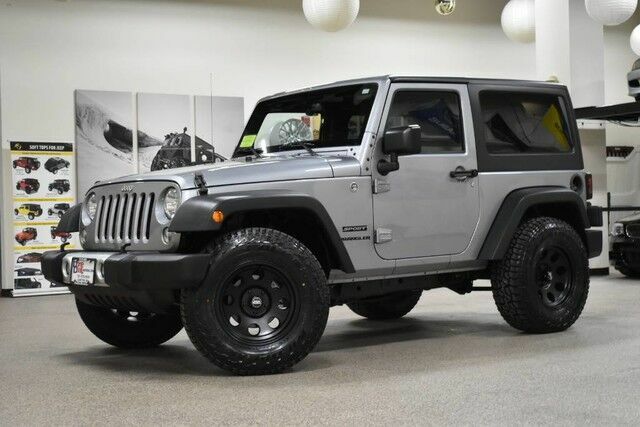 If you're in the market for an incredible SUV -- and value on-the-road comfort and manners more than ultimate off-road prowess or tow capacity -- you'll definitely want to check out this Jeep Wrangler Sport.